At Total Care Endodontics & Microsurgery, we believe that everyone should have their own healthy teeth for an entire lifetime. We also strongly believe that everyone should be empowered with the knowledge to make the best decisions for their health care. Our role is to educate you regarding your endodontic (root canal) status and show you all available treatment alternatives. We partner with our patients and their referring dentists to select and implement the best treatment plan, and our care does not stop there. We monitor all of our patients with routine follow-up exams that are free of charge. We are committed to preserving your natural teeth. We strive to make every patient's experience a pleasant one by relieving their pain and providing excellent endodontic (root canal) treatment with effective and predictable results. 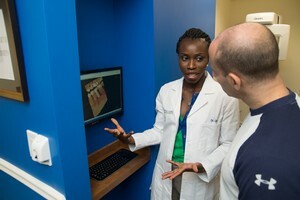 This is accomplished by utilizing scientifically proven, evidence-based endodontic techniques, as well as the latest state-of-the-art technology to enhance patient care. When you are in pain, time is of the essence. That is why we offer same day service, on-line health and medical history forms, convenient office hours, and emergency appointments. If you are experiencing discomfort, call us at 973.821.5656 and we will take CARE of you.